Get to know Chicago's elite private clubs-and the consequences peons face for sneaking in to one for a little lunch. While the majority of us busy ourselves bellyaching over the peak prices of gas and milk, a privileged, well-heeled few prolong their childhood tree-house days inside private downtown social clubs, where little old men distribute towels in the bathroom and the phrase just put it on my account is tossed off with as much nonchalance as most of us muster to say pass the Funyuns. How difficult could it be, we wondered, for the average schmoe to penetrate these members-only societies? 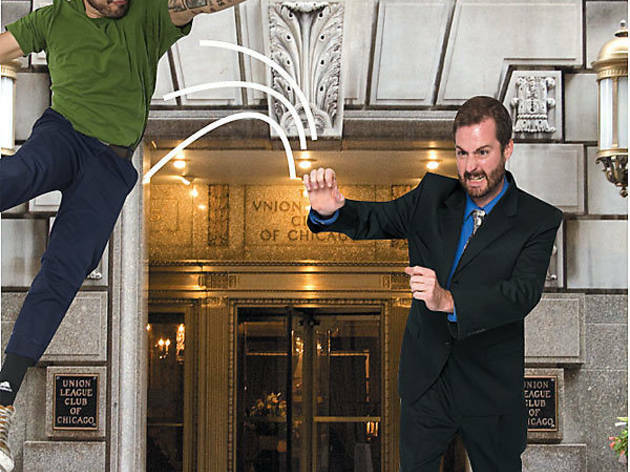 As we discovered during a day spent exploring (and getting booted out of) downtown Chicago’s snootiest clubs—high society doesn’t greet social climbers with open arms. Private dining room, a lounge with views of the lake and Grant Park, and 35 guest rooms. Applicants must be sponsored by a member, have a seconder and submit letters of support from other members. Nope. The club’s sartorial standards demand business attire and “corporate casual” at all times. After an intimidatingly muscled doorman treats us to an uncomfortably long session of distrustful elevator eyes, three club staff members swarm in and cut us off halfway to through the lobby before sternly shooing us out of the building. As we retreat, one of them spits something in our direction about Arby’s. Can I at least use the bathroom? Two dining rooms, a basketball court, swimming pool, sauna, masseuse and 60 guest rooms. Based on age. A 25-year-old pays a $500 initiation fee and $81 per month. Members over 40 dole out $400 per month. Must be sponsored by three current members. The applicant is voted on by the membership committee, the membership, then by the board of directors. The maître d’ seats us in an ornate dining room packed with power suits. Score! Soon after, though, our waiter is horrified to learn we don’t have a “club number.” The dining-room manager saunters over to our table, takes one look at us and recommends the greasy-spoon diner across the street. He is less than amused when we ask for our bread and butter to go. Four dining rooms, pool, squash courts, laundry/dry-cleaning service, masseuse. Plus, join the ranks of the always-exciting Investment Society. Based on age. Most members pay a $1,500 initiation fee and $245 per month. Must be a college graduate, complete a nomination form (which can be requested only by a member) and show three letters of recommendation. Yes, but on weekends only. Edwin, a staff member dressed in a green bellboylike suit, picks up our not-a-member scent immediately and leads us to a “casual waiting room” ghetto where we read Home on the Lake magazine for ten minutes while waiting for a “membership representative” who never arrives. “Just leave,” says a frustrated Edwin. Three dining rooms, two bars, two ballrooms, 200 guest rooms, pool, basketball court and access to a 750-piece private art collection. Based on age. The majority shell out a $1,250 initiation fee and $210 per month. Applicant must have two sponsors and three references. Yes, on Saturdays before 5pm, Sundays and national holidays. As we enter the building, an affable staff member leans in and whispers, “People are gonna freak out if they see you wearing blue jeans.” As we argue fruitlessly that our jeans are in fact gray, Joey escorts us to a room near the coat closet where he advises we put on “rental slacks” if we insist on staying in the lobby. We leave.